Halogen fixtures in the form of headlights are commonly found in the automobile sector. The luminary has an average lifespan of 1,000+ hours, and is generally inexpensive to manufacture. During light production, the units utilize a special mixture of gas- nitrogen, argon and tungsten filament, which is housed in a glass casing. As electrical current moves through the bulb, high heat is generated, the gases are activated and light is produced. Inside the bulb, the temperature of the filament can reach up to 2,500 degrees Celsius. This process causes halogens to produce more heat than light during output, greatly lowering its energy efficiency. HID lamps rely on a mixture of gases and metals to create light. The luminaries are known for their ability to produce bright white, bluish beams. However, they also generate infrared light, which makes up around 30 percent of emissions during output. Since humans can’t see infrared waves, this feature is not useful in everyday situations. It is important to point out that HID luminaries are up to three times brighter than halogens. They also have lower energy requirements, typically drawing low wattages during output. When it comes to lifespan, the fixtures also last longer than halogens, at 6,000-24,000+ hours. HID units offer higher color temperature ratings between 4,200-6,000K, compared to halogen lights at 3,500K. This translates to clearer, white light beams at night. Lights with high color temperature ratings perform well when illuminating dark locations, and the bluish tone of the beams closely resembles natural sunlight. When used for long periods, exposure to lights with high color temperature profiles, such as HIDs, can improve alertness and reaction times, increasing the overall safety of the operator. By comparison, halogen lights emit yellowish, warm tones, like incandescent bulbs, and have a glowing appearance, as opposed to brilliant illumination. This type of lighting condition is suitable for relaxing, nighttime environments. Increasing the brightness or intensity levels of halogens may improve illumination of the target location. However, making such adjustments does not affect the warm color temperature rating of the luminary. A report from Emnid, a Germany-based marketing research firm, elaborates further on firsthand consumer experiences with HID xenon lamps. The group released a survey in 1997, and found that roughly 85 percent of xenon light users felt they could see better at night. For the 50 and up age group, this figure increased dramatically to 90 percent. Over 94 percent expressed positive views toward HIDs, with focus on optimal brightness levels and general illumination capabilities. HID luminaries are highly recommended over halogen lamps, when used as hunting lights. With improved visibility that comes with HIDs, individuals can navigate trails, dirt roads and open fields effortlessly. Hunters may also use HID spotlights to locate and identify animals in far distances. The fixtures are widely known in the hunting sector for producing tight, concentrated beams of light, making them ideal for both handheld, portable devices and mounted lights on vehicles. 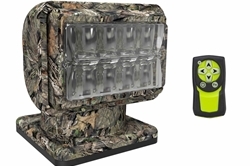 Since HIDs produce less heat and have lower energy requirements, hunters could comfortably use the units for a longer period of time on the field. Lastly, from a safety perspective, HIDs could help hunters detect dangerous elements on the field, including aggressive animals, protruding branches and treacherous drops, in a timely manner.